With an abundance of produce all summer long, this is such a great time of year to be following a Paleo diet. 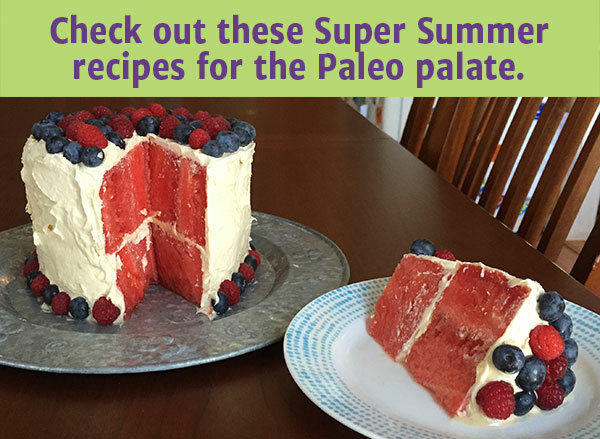 Whether you are looking for a fun and tasty Paleo dish to bring to a cookout or simply need some inspiration for Paleo snacks on hot summer days at home, look no further! Below we have a refreshing tomato watermelon edamame salsa, a garden-fresh caprese salad with Paleo balsamic vinaigrette, all-natural creamy Paleo chocolate coconut popsicles, and a beautiful watermelon cake with Paleo “cream cheese” frosting and fresh berries. All of the recipes can even be made vegan. These vegan-friendly, Paleo recipes are sure to be a hit at your next picnic or party! This Paleo-friendly, vegan recipe is such a great twist on the usual salsa and is perfect for summer. Use it as a dip for Paleo chips, crackers, or tortilla chips, atop cooked meat or fish, or just eat it by the spoonful! Chop tomato and watermelon and toss in a bowl. Save the liquid that comes from cutting up the fruit and add it to the bowl. Add as much edamame as desired; I used one 10 oz bag of frozen Cascadian Farms Organic Edamame. Add cilantro, salt, and hot sauce to taste. I added two handfuls of fresh-from-our-garden cilantro, finely chopped, and 1 teaspoon of salt. Toss fresh from the garden tomatoes and basil in this Paleo balsamic vinaigrette to make a great caprese salad. Add in some fresh mozzarella if you are not avoiding dairy. I find that using all EVOO in homemade dressings doesn’t always refrigerate well. Instead, I use a half and half blend of EVOO and sunflower oil and have never had any problems refrigerating dressings. Avoid the unhealthy oils like soy, canola, peanut, etc. because of over-processing, hydrogenation, and GMOs. Shake all ingredients well in a jar. Drizzle over caprese salad, greens from the farmer’s market, or other favorites. Dressing recipe adapted from originaleating.com. Remember Fudgesicles? These are a chocolately, creamy, Paleo alternative — all the flavor, minus the unhealthy ingredients! Makes 6 pops. Substitute the honey with maple syrup for vegan Fudgescicles. Blend all ingredients well and pour into popsicle molds. Freeze for at least 2 hours. Run molds under lukewarm water for easy removal. Recipe adapted from Paleo Hacks. 1. Make frosting first. See recipe below for Paleo “cream cheese” frosting or use fresh whipped (coconut or dairy) cream. 2. Cut the ends of a whole watermelon off so it is relatively uniform in size. 3. Place on one of the flat ends and slice off the rind and any white of the fruit. 4. Shape to be relatively round. 5. Put on side and slice in half to produce 2 “cake” layers. 6. Pat dry both cakes so that the frosting sticks better. 7. Place one “cake” on serving tray. Frost top. Place other “cake” on top continue frosting. 8. Decorate with fruit of the season. We used raspberries from out garden and organic blueberries. YUM!!!! Put everything into a food processor and blend until smooth and creamy. Paleo cream cheese frosting recipe from the Swiss Paleo website.